28th Shawwāl 1438 / 22nd July 2017. The recent death of our beloved elder brother Abu ‘Umar Farūq رحمه الله caused me to reflect upon my time upon this blessed da’wah, the relationships and brotherhood that Allah has blessed me to witness over the years. During the previous few decades, the Salafi Da’wah has witnessed the death of some of greatest scholars of this era, the likes of Shaykh Nasir ud-Dīn al-Albānī, Shaykh ‘Abdul Azīz bin Bāz, Shaykh Muhammad bin Sālih al ‘Uthaymīn, Shaykh Muqbil bin Hādī al Wād’ī رحمهم الله. The knowledge, bravery and call of these scholars has, by the grace of Allah, caused the rejuvenation of the Salafī call across the Islamic world; along with the likes of Shaykh Muhammad Amān Jamī, Shaykh Hammād al Ansārī, Shaykh Ahmad an-Namjī, Shaykh Zayd al Madkhalī, Shaykh ‘Abdullāh al Ghudayān رحمهم الله, And their brothers from amongst those Scholars who are alive today such as Shaykh Rab’ī bin Hādī al Madkhalī, Shaykh ‘Ubayd al-Jābirī, Shaykh Sālih al Fawzān حفظهم الله, and others. These aforementioned scholars had spread the Salafī call far and wide, with their writings and lectures, their defences of the Sunnah and its people, their refutations of innovations in the religion and its people. From the fruits of this blessed da’wah, we witnessed their speech and writings being translated into many languages around the world. In the English language, we began to see articles, documents and websites surface, promoting the call to the pure Sunnah, Salafiyyah. Students who had a grasp of the Arabic language began to translate the speech of the scholars within their lessons. 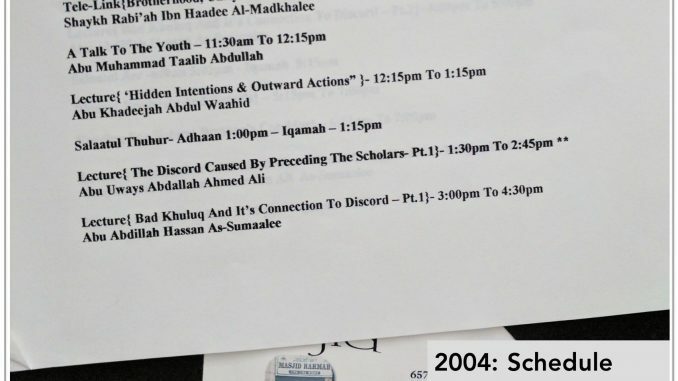 By the grace of Allah, these students began to connect the English speaking audiences to the Salafi scholars. From those who were most proficient in translating the writings of the scholars, we had Abu Iyaad Amjad Rafīq حفظه الله and Abu Talhah Dawūd Burbank رحمه الله. The audio lectures were being translated and delivered by the likes of Abu Hakeem Bilāl Davis (whilst he was a student at the University of Al-Madīnah). Over the last two decades we have witnessed this blessed da’wah being promoted and defended by these brothers, along with the likes of Abu Uways Ahmad Ali رحمه الله, Abu Khadeejah Abdul Wāhid, Hasan Somāli, Amr Bashīr, Abul Hasan Mālik, Abdulilah Lahmami, Uways Taweel, Abu Idrees, Abu Umar Farūq رحمه الله, and many others from amongst the Salafī students of knowledge. As the months and years passed, the Da’wah Salafiyyah grew. masajid, centres, bookstores appeared. Having a Salafi masjid or centre became common place in most major cities. The blessings of Allah upon our communities in the West is unmeasurable. However, many of us have become negligent and ungrateful, blind to the realities and forgetful of the past. From this heedlessness and neglect that is prevalent in recent times, we find our communities not realising the value of the students of knowledge. Those who have worked tirelessly in conveying the words of the scholars, promoting the Sunnah in the West. The sad reality is, that many only recognise the value of a student of knowledge once he has died! And we have witnessed this with our own eyes. We have witnessed heartache and sorrow along with various communities when they have lost a student of knowledge. Recent events caused me to see the great need to remind myself and my brothers of the blessings of Allah upon us. The need for us to recognise the blessings of brotherhood we have. Recognise that we have students of knowledge that strive to aid the deen of Allah. They suffer many difficulties upon this way, whether it be their families suffering due to the time constraints upon them. Or financially, many suffering difficulties in order to pursue the path of da’wah il-Allah. Many of them being attacked or slandered for no reason other than their affiliation to the Salafi manhaj. Even after the sad recent events, it is hoped that we will take lessons that will cause us to value those who teach us our deen. Those who sacrifice their own time, to earn the reward of Allah and convey His religion to the masses. Those who have always been a link for us to our scholars. May Allah preserve them all. 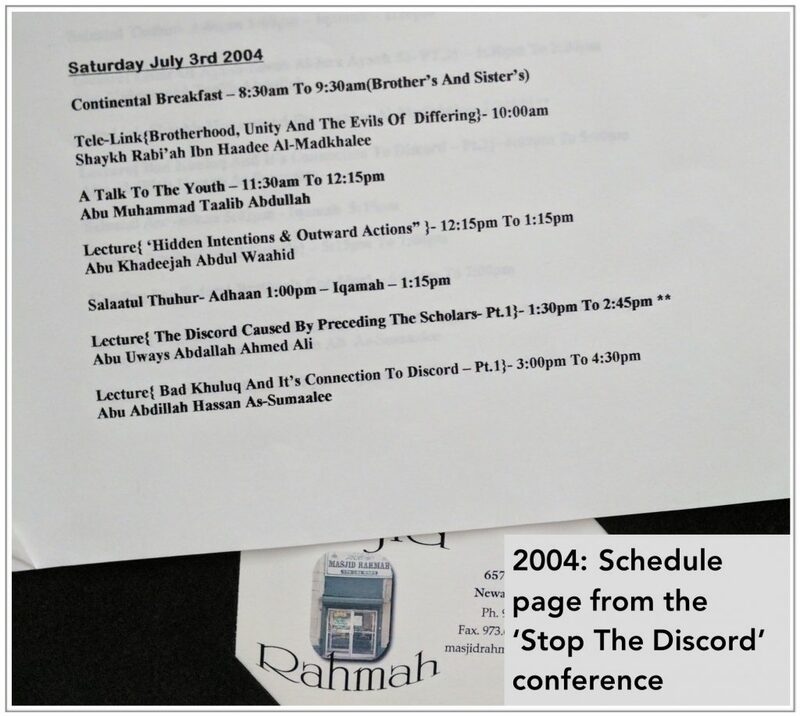 During 2004 Allah allowed me to travel to America with my elder brother, companion and teacher Abu Khadeejah حفظه الله, he was invited to lecture at the ‘Stop The Discord’ conference in New Jersey, along with Abu Uways رحمه الله. Our dear brothers Hasan Somālī, Abul Hasan Mālik, Anwar Wright حفظهم الله were also present, as well as others. Many of the Salafi marākiz were represented also, such as our brothers from Troid (Canada). I remember clearly the love and brotherhood present in the gatherings we had, the love that everyone had for Abu Uways رحمه الله, likewise, the love and concern he had for everyone. He was extremely unwell at the time, but he did not allow that to dampen his enthusiasm to defend and promote the Salafi manhaj. It was a truly amazing event. Not long after we returned to the UK we received the phone call informing us of the death of Abu Uways رحمه الله. A mountain amongst the callers in the West was gone! We felt great sorrow, we had lost one of our dearest brothers. No doubt, the Salafīs in New Jersey and Philadelphia were heartbroken and felt a great loss. A truly amazing courageous man, a defender of Ahlus-Sunnah! Then came those who betrayed the Salafi manhaj Abu Uways was upon. They remained silent in his lifetime, seemingly agreeing with him رحمه الله, however upon his death, and the years that followed, you witnessed their realities. They oppose the manhaj he was upon, attack those whom he defended, and even use his name to defend the people of innovation! Recently some of them even had the audacity to try and use his speech to defend Al-Hājūrī!!! Abu Uwais’ legacy will always be that he loved the Sunnah, Salafiyyah and its people. He detested innovation and its people and their centres. رحمه الله. I had known Abu Talhah رحمه الله ever since I moved to the city of Birmingham. He was a man of Sunnah, adhering to it staunchly. He would prepare his classes with great detail and care. As I got to know him better, I realised he was a witty and humorous brother, who had a great love for Ahlus-Sunnah. In my early days, he visited my house many times. He used to love discussing the writings of the scholars, their books, he loved books رحمه الله. There was a period of time that he allowed me to visit his home once a week to go through a particular subject, an extremely beneficial brother. He always spoke to me openly regarding the affairs that needed addressing, and would always ask that the input of Abu Hakeem and Abu Khadeejah be sought. This emphasised both his love for the other students of knowledge and his humbleness رحمه الله. In 2011 Allah decreed that I perform Hajj along with some of our brothers, amongst them, our elder, our teacher Abu Talhah رحمه الله. I refrained from speaking about this time period openly before, however, the recent death of Abu ‘Umar رحمه الله caused many of the same feelings to resurface, and I felt that many lessons can be learnt from these occurrences, lessons that should cause Ahlus Sunnah to reflect. Occurrences that should cause us to value the blessings of Allah upon us, and to treasure the brotherhood that we have been blessed with. As is well known amongst Ahlus Sunnah, Abu Talhah and his wife lost their lives upon that journey, may Allah shower them with His mercy and grant them Paradise. We had broken away from the main group, a small number of us had boarded a mini bus from Jeddah airport, heading to Makkah. We didn’t make it. Along the way, the engine of our mini bus caught fire, we all attempted to evacuate the mini bus but the fire spread within seconds. As I stepped out, the two sons of Abu Talhah followed, however, he himself, along with his wife were prevented from exiting by a wall of flames that had erupted from the engine at the front of the mini bus. As we attempted to fight the flames and gain access to the bus, the fire just continued to escalate. We moved others away as debris was flying with each explosion that occurred. As the authorities arrived and the reality of what was actually happening sunk in, we began to realise we’d lost a noble brother and sister الله يرحمهما. Abu Talhah رحمه الله was another mountain in the west, a close friend of Abu Uwais رحمه الله, and now he was no longer with us. As we sat with the bodies in the ambulance, prayed the Janazah in the Masjid al-Haram and went to the grave yard I remember feeling numb and truly in shock at what I’d witnessed. The Hajj ministry granted us a driver and special travel permission to visit the scholars in Al-Madīnah. At the completion of the rights of Hajj, myself and the two sons of Abu Talhah رحمه الله visited Al-Madīnah. Our brother Uways Taweel حفظه الله accommodated us, we visited our Shaykh, ‘Ubayd al-Jābirī حفظه الله and Shaykh, Muhammad bin Hādī حفظه الله they offered condolences and beautiful advice to the children. Upon our return to Makkah, we sat with the noble Shaykh, Rabī bin Hādī al Madhkalī, again he made du’ā for Abu Talhah and his wife and their children. And gave some beautiful words of advice حفظه الله. As we boarded the flight home, I was extremely sad, silent reflection upon the decree of Allah, pondering over the advice of our scholars aided me and helped me through an extremely difficult time. During the days and months that followed, as had happened after the death of Abu Uwais رحمه الله, a similar pattern ensued. People began to show their true colours, those who had remained silent during his lifetime, they had claimed to be his students and companions but their realities surfaced. Those who had shown loyalty to that which he had called to whilst he was alive, disappeared as news of his death spread! Some of them disappeared never to be seen amongst the Salafīs again! Others began to speak against the Salafi marakiz/masājid. Some began to attend the masājid of Ahlul bid’ah and refused to pray within the Salafi Masjid where Abu Talhah حفظه الله had taught! These traitors have not ceased to cause corruption till this day. They champion his name, but oppose everything he stood for! Cowardly individuals who warn against Ahlus-Sunnah, whilst aligning themselves with the people of Bid’ah in their masājid. The reality is, they never truly understood what this great man called to! Abu Talhah’s legacy will always be that he loved the Sunnah, Salafiyyah and its people. He detested innovation and its people and their centres. رحمه الله. Rarely does a day go by except the fire that we witnessed that day crosses my mind. We lost a dear brother, a mountain in the west, a beloved companion. 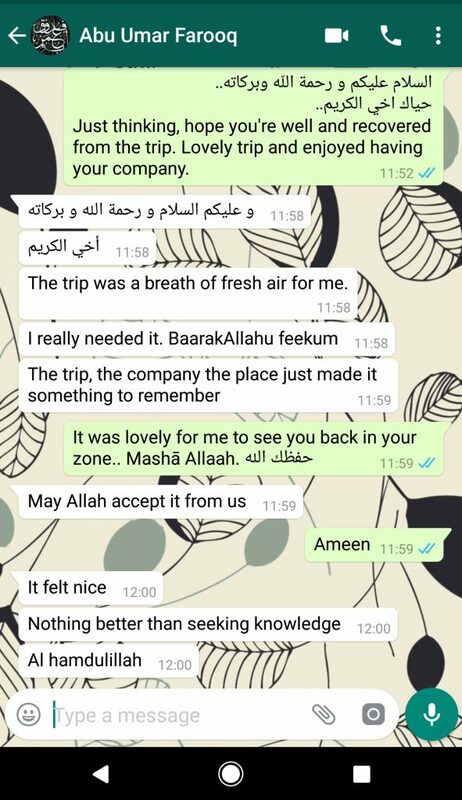 However, I also remember our last conversation we had, his love for the scholars, their books, also his love for our brothers, Abu Hakeem, Abu Khadeejah, Abu Iyaad حفظهم الله. His words always encouraged me to aid and cooperate with our brothers and to advise one another sincerely. I’d known Abu ‘Umar رحمه الله since 2001 when I’d travelled for Umrah with my elder brother Abu Zayd, we stayed with my noble brother and teacher Abu Idrees in al-Madinah. Throughout the years I’d always known Abu ‘Umar to be a noble, honest man, a defender of the Salafi manhaj. Even with his illness all these years, I’d never heard him complain once. As with Abu Uwais رحمه الله that which was of paramount concern for him, was to promote the pure Salafi methodology. Recently (April 2017) Allah blessed us to perform Umrah along with Abu Umar رحمه الله. After Umrah whilst in Makkah he attended hospital for dialysis, due to technicalities with the hospital, it took almost 24 hours! But as usual, Abu Umar didn’t complain! I witnessed him smiling with happiness due to visiting the scholars again. He likewise shed tears in some of those gatherings due to the love he had for the Sunnah and its people. As we entered the house of Shaykh ‘Ubayd al Jābirī حفظه الله one evening, Abu ‘Umar turned to me and said: “I’ve missed this feeling!” He missed being in the presence of the scholars, he was smiling, filled with joy! Upon entering the room, Shaykh ‘Ubayd al Jābirī حفظه الله (who is blind) greeted each of us individually and we stated our names to introduce ourselves. He showed happiness at the attendance of Abu ‘Umar, who he’d known for many years and often asked us regarding his health. As Shaykh ‘Ubayd met him, he began to make du’ā for Abu ‘Umar, this caused Abu ‘Umar to cry. As he sat next to me, he continued to cry up until Shaykh ‘Ubayd shared some words of humour, which caused Abu ‘Umar to laugh! I looked towards him and he was laughing whilst still having tears rolling down his cheeks! He showed similar emotions when we were invited for dinner with the noble Shaykh, Muhammad bin Hādī حفظه الله. He loved knowledge and its people. He loved Ahlus-Sunnah and the Salafī centres in the UK. He showed a great dislike for the people of Bid’ah. He also disliked those who played games with the truth, those who betrayed Da’wah Salafiyyah. Three or so months pass by after that amazing journey and we received the heartbreaking news that our noble brother had passed away. The Salafī community had lost another defender! A brave and beneficial man رحمه الله. His funeral was attended by people from all over the country. Personally, I haven’t witnessed it’s like within the UK. May Allah shower him with mercy and protect his family. Abu Umar’s legacy will always be that he loved the Sunnah, Salafiyyah and its people. He detested innovation and its people and their centres. رحمه الله. The loss of all three of these noble brothers was a huge blow to the Salafi community worldwide, may Allah grant them all the highest level of Paradise. No doubt there is great sorrow at the passing of any of our scholars or the students of knowledge. However, we know this is the deen of Allah and He will preserve it. The eyes may shed tears but we only say that which pleases our Lord. Love of the sunnah, placing it before anything else. Love for knowledge and its people. Love of the Salafi scholars and their books. Love for Ahlus-Sunnah and defending them. Having patience with the decree of Allah. Unity and cooperation with the Salafis. Staying away from the marakiz/masājid of Ahlul Bid’ah / Hizbiyyah. Sincerely advising and maintaining the brotherhood. The main point I wish to emphasise is that we must realise the blessings of Allah upon us. Benefit from our scholars whilst they are alive, likewise the students of knowledge in our cities in the West. Indeed, it’s only when we lose a teacher that we realise the value of his lessons. We must also stand up and defend our teachers from those who attack them, realising that they are only being attacked due to the Salafi methodology they promote. We must aid and support one another to protect the Salafi Masājid and centres that are being attacked and plotted against. May the peace and blessings of Allah be upon our noble Prophet صلى الله عليه وسلم, his family and his companions.